from the BBC programme The Life Scientific, 25 October 2011. Dame Susan Jocelyn Bell Burnell DBE FRS FRSE FRAS FInstP (/bɜːrˈnɛl/; born 15 July 1943) is an astrophysicist from Northern Ireland who, as a postgraduate student, co-discovered the first radio pulsars in 1967. She was credited with "one of the most significant scientific achievements of the 20th century". The discovery was recognised by the award of the 1974 Nobel Prize in Physics, but despite the fact that she was the first to observe the pulsars, Bell was not one of the recipients of the prize. The paper announcing the discovery of pulsars had five authors. Bell's thesis supervisor Antony Hewish was listed first, Bell second. Hewish was awarded the Nobel Prize, along with the astronomer Martin Ryle. Many prominent astronomers criticised Bell's omission, including Sir Fred Hoyle. In 1977, Bell Burnell played down this controversy, saying, "I believe it would demean Nobel Prizes if they were awarded to research students, except in very exceptional cases, and I do not believe this is one of them." The Royal Swedish Academy of Sciences, in its press release announcing the 1974 Nobel Prize in Physics, cited Ryle and Hewish for their pioneering work in radio-astrophysics, with particular mention of Ryle's work on aperture-synthesis technique, and Hewish's decisive role in the discovery of pulsars. In 2018, she was awarded the Special Breakthrough Prize in Fundamental Physics. She donated the whole of the £2.3 million prize money to help female, minority, and refugee students become physics researchers. 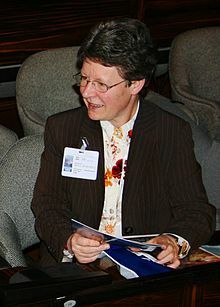 Jocelyn Bell was born in Lurgan, Northern Ireland, to M. Allison and G. Philip Bell. Her father was an architect who had helped design the Armagh Planetarium, and during visits she was encouraged by the staff to pursue astronomy professionally. Young Jocelyn also discovered her father's books on astronomy. She grew up in Lurgan and attended the Preparatory Department[a] of Lurgan College from 1948 to 1956, where she, like the other girls, was not permitted to study science until her parents (and others) protested against the school's policy. Previously, the girls' curriculum had included such subjects as cooking and cross-stitching rather than science. You do not have to learn lots and lots ... of facts; you just learn a few key things, and ... then you can apply and build and develop from those ... He was a really good teacher and showed me, actually, how easy physics was. Bell Burnell was the subject of the first part of the BBC Four three-part series Beautiful Minds, directed by Jacqui Farnham. 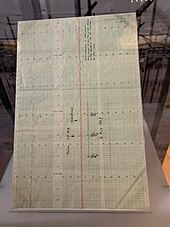 In July 1967, she detected a bit of "scruff" on her chart-recorder papers that tracked across the sky with the stars. She established that the signal was pulsing with great regularity, at a rate of about one pulse every one and a third seconds. Temporarily dubbed "Little Green Man 1" (LGM-1) the source (now known as PSR B1919+21) was identified after several years as a rapidly rotating neutron star. This was later documented by the BBC Horizon series. She worked at the University of Southampton between 1968 and 1973, University College London from 1974 to 82 and the Royal Observatory, Edinburgh (1982–91). From 1973 to 1987 she was a tutor, consultant, examiner, and lecturer for the Open University. In 1986, she became the project manager for the James Clerk Maxwell Telescope on Mauna Kea, Hawaii. She was Professor of Physics at the Open University from 1991 to 2001. She was also a visiting professor at Princeton University in the United States and Dean of Science at the University of Bath (2001–04), and President of the Royal Astronomical Society between 2002 and 2004. Bell Burnell is currently Visiting Professor of Astrophysics at the University of Oxford, and a Fellow of Mansfield College. She was President of the Institute of Physics between 2008 and 2010. In February 2018 she was appointed Chancellor of the University of Dundee. In 2018, Bell Burnell visited Parkes, NSW, to deliver the keynote John Bolton lecture at the CWAS AstroFest event. In 2018, she was awarded the Special Breakthrough Prize in Fundamental Physics, worth three million dollars (£2.3 million), for her discovery of radio pulsars. The Special Prize, in contrast to the regular annual prize, is not restricted to recent discoveries. She donated all of the money "to fund women, under-represented ethnic minority and refugee students to become physics researchers", the funds to be administered by the Institute of Physics. First, demarcation disputes between supervisor and student are always difficult, probably impossible to resolve. Secondly, it is the supervisor who has the final responsibility for the success or failure of the project. We hear of cases where a supervisor blames his student for a failure, but we know that it is largely the fault of the supervisor. It seems only fair to me that he should benefit from the successes, too. Thirdly, I believe it would demean Nobel Prizes if they were awarded to research students, except in very exceptional cases, and I do not believe this is one of them. Finally, I am not myself upset about it – after all, I am in good company, am I not! Elected a Fellow of the Royal Society (FRS) (March 2003). Elected a Fellow of the Royal Society of Edinburgh (FRSE) (2004). In February 2014, she was elected President of the Royal Society of Edinburgh, the first woman to hold that office. She held the position from April 2014 to April 2018 when she was succeeded by Dame Anne Glover. In 2016, the Institute of Physics renamed their award for early-career female physicists the Jocelyn Bell Burnell Medal and Prize. Bell Burnell is house patron of Burnell House at Cambridge House Grammar School in Ballymena. She has campaigned to improve the status and number of women in professional and academic posts in the fields of physics and astronomy. From her school days, she has been an active Quaker and served as Clerk to the sessions of Britain Yearly Meeting in 1995, 1996 and 1997. She delivered a Swarthmore Lecture under the title Broken for Life, at Yearly Meeting in Aberdeen on 1 August 1989, and was the plenary speaker at the US Friends General Conference Gathering in 2000. She spoke of her personal religious history and beliefs in an interview with Joan Bakewell in 2006. Bell Burnell served on the Quaker Peace and Social Witness Testimonies Committee, which produced Engaging with the Quaker Testimonies: a Toolkit in February 2007. In 2013 she gave a James Backhouse Lecture which was published in a book entitled A Quaker Astronomer Reflects: Can a Scientist Also Be Religious?, in which Burnell reflects about how cosmological knowledge can be related to what the Bible, Quakerism or Christian faith states. In 1968, soon after her discovery, Bell married Martin Burnell; the couple divorced in 1993 after separating in 1989. Her husband was a local government officer, and his career took them to various parts of Britain. She worked part-time for many years while raising her son, Gavin Burnell, who is a member of the condensed matter physics group at the University of Leeds. ^ The Preparatory Department of Lurgan College closed in 2004, the college becoming a selective grammar school for ages 14–19. ^ Interplanetary scintillation allows compact sources to be distinguished from extended ones. ^ a b c d Who's Who 2017. ^ a b c Lurgan Mail 2007. ^ Bell Burnell 2007, pp. 579–581. ^ a b Hewish et al. 1968, p. 709. ^ a b Pilkington et al. 1968, p. 126. ^ a b The Life Scientific 2011. ^ Cosmic Search Vol. 1. ^ a b BBC Scotland 2014. ^ Hargittai 2003, p. 240. ^ a b NYAS 1977. ^ a b Kaplan & Farzan 2018. ^ Johnston 2007, pp. 2–3. ^ Interview at NRAO 1995. ^ Jocelyn Bell Burnell profile. ^ University of Bath 2004. ^ Institute of Physics: Council. ^ Univ of Dundee 2018. ^ Warren & Thackray 2018. ^ Walter 1982, p. 438. ^ AIoP 1978, p. 68. ^ Institute of Physics 2017. ^ Académie des sciences 2018. ^ Bell Burnell 2004, pp. 426–89. ^ QPSW Testimonies Committee 2007, p. ?. ^ Condensed Matter Physics Group 2010. Allan, Vicky (5 January 2015). "Face to Face: science star who went under the radar of Nobel Prize judges". The Herald. Glasgow. Retrieved 30 December 2015. "Bell Burnell, Dame (Susan) Jocelyn, (born 15 July 1943), astronomer; Visiting Professor of Astrophysics, University of Oxford, since 2004; President, Royal Society of Edinburgh, 2014–March 2018". Who's Who (UK). Oxford University Press. 1 December 2017. doi:10.1093/ww/9780199540884.013.7157. "Dame Jocelyn Bell Burnell". The Life Scientific. 25 October 2011. BBC Radio 4. Retrieved 18 January 2014. Eisberg, Joann (1997). "Jocelyn Bell Burnell (1943–)". In Shearer, Benjamin F.; Shearer, Barbara (eds.). Notable Women in the Physical Sciences: A Biographical Dictionary. Westport, CT and London: Greenwood Press. pp. 9–14. ISBN 978-0-313-29303-0. "Jansky Home Page". National Radio Astronomy Observatory. Retrieved 14 May 2009. "Lurgan College: School History". Retrieved 7 February 2018. Ouellette, Jennifer (6 September 2018). 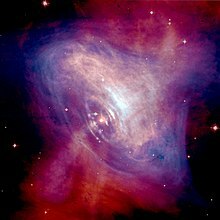 "Jocelyn Bell Burnell wins $3 million prize for discovering pulsars". Ars Technica. Retrieved 6 September 2018. "Royal Medal". Royal Society. Retrieved 20 July 2015. Sample, Ian (6 September 2018). "British astrophysicist overlooked by Nobels wins $3m award for pulsar work". The Guardian. Retrieved 6 September 2018. Coroniti, Ferdinand V.; Williams, Gary A. (2006). "Jocelyn Bell Burnell". In Byers, Nina; Williams, Gary (eds.). Out of the Shadows: Contributions of Twentieth-Century Women to Physics. Cambridge University Press. ISBN 978-0-521-82197-1.